I'm unsure of how to post on the link bar, but I think that the Ministry of Youth, Sports and Tourism should have a link on the page. The address is http://azerbaijan.tourism.az/. I removed the administrative divisions from the main page because they are not useful to the traveler and are visually overwhelming. The links, which I have copied below, should be turned into redirects to the appropriate Azerbaijani regions once we have worked out a hierarchical regional structure for the country. Here's my rough draft of a regions hierarchy; I would appreciate comments! Once we have settled on the hierarchy, I will turn this into a Wikitravel-style regions map. I would like to propose using these region names which coincide with the Azeri Tourism Ministry. This could be helpful if travelers need to gather information from the Tourism Office while visiting. Rayons should also be listed for the regions. For regions like Nakhchivan, the area included is not hard to distinguish, but as it is listed now on wikitravel, it is difficult to tell where some of the borders are. This will also help avoid overlap. 1. 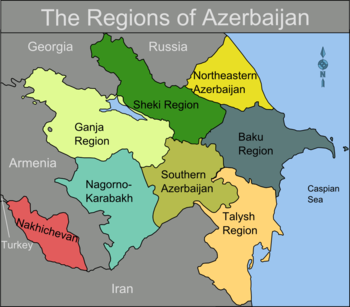 I think that southern Azerbaijan should be divided between the Southeast and South central. I think that the areas are quite different, so it would be better to do that. 2. Ucar, Zardab and Kurdimir should be in the southern region. 3. Shamaxi should be included in the Center region. There are noty such regions as Talysh region and Nagorno-Karkabakh regions.The region which refers to Nagorno-Karabakh is indeed is absolutely mis-representation. There is Greater Karabakh. Nagrono Karabakh is just part of the Greater Karabakh geographically, ethnically, and historically. Second, there is not a region called Talysh region. Talish people are constitutent part of the Azerbaijani nation, adding up to 70 thousand people. They mostly live only in 3 administrative regions of Astara, Lenkeran and Lerik. In the rest of the region which you refer as the Talysh the majority of the population ethnically is not Talysh. So this is first of all injustice and mis-representation of facts again. THird, I am suggesting to editors to remain aside of politics. THis is a wiki web site for tourists, not for politicians. We here in Azerbaijan do not change or name regions just becuase some foreigners or tourists like the name or it would seem interesting to them. Northeastern Azerbaijan → "Guba-Khachmaz Region"
I like these four proposals, as they rename regions & redraw regions to reflect local names & local cultures. But you have forgotten the rest of the rayons in the current Ganja Region—do you think that should be left intact, after having broken off the rayons going into the Shirvan Region? You also left out Khizhi from your proposal—should it belong to the "Shirvan Region?" I oppose creating a Nakhchivan Region of Azerbaijan, because the vast majority of it is controlled by Armenia & the unrecognized government of Nagorno-Karabakh, and is therefore not open to visitors from Azerbaijan. I prefer to leave the current Nagorno-Karabakh section of the map as is, as it delineates, more or less, the line of control. I also oppose the name change from Talysh Region to Lankaran-Astara—I prefer "Talysh Region" because that refers to the culture of the region, rather than simply its principal cities. Thanks for pointing out my oversite on Ganja. It should be the final region. The Tourism Ministry calls it the Ganjabasar Region. This would include: Yevlakh, Mingechevir, Goranboy, Ganja, Khanlar, Dashkesan, Samukh, Shamkir, Gadabey, Tovuz, Gazakh, and Agstafa. Khizhi is generally grouped with the Guba-Khachmaz regions of the NE. I agree with your idea of the Nakchivan Region would be confusing to travelers to have the occupied territories listed under Azerbaijan, but they are accepted as Azeri territories. Perhaps they should be included in a section called "Occupied Territories" also. This might have a few benefits including travel warnings. As you can imagine, this territory is a hot topic throughout Azerbaijan. Not listing it on the Azer travel page could also be perceived as a political affiliation. I don't think the Talysh Region name needs to change. Same goes with the Sheki page. But for the Talysh Region, we should definitely include rayon names. I've never heard it referred to as the Talysh Region by locals. They go by rayon/city names. Lankeran is synonymous with SE. In short, I think the following pages should be added: add Khizhi to Guba-Khachmaz; add a Ganjabasar Region; and an Occupied Region. Jabrayil, Kalbajar, Lachin, Qubadli, Khojali, Khojavand, and Zangilan. All these towns are under the full control of either the Nagorno-Karabakh separatist government or the Armenian military and, I believe, are totally closed to foreigners. Many, if not all, may also be ghost towns with no remaining places to stay. I'm not too sure what to do with these—we could change the regional structure of Azerbaijan somewhat to have a Nagorno-Karabakh region and a Armenian occupied territories region to cover these cities, but I'm not sure we should bother if no one can go to these places anyway. Entering Azerbaijan from Georgia. All I needed to do was fill out a form, put down an address of a hotel, pay $63 (for Canadians), provide2 passprot photos and I was fine. No letter of invitation needed. The region of Nagorno-Karabakh was the subject of a war with Armenia that has left it a de facto independent republic. "Occupied" by the Armenian army, this conflict has not officially ended with minor skirmishes frequent, and is a major source of contention among Azerbaijanis. The Nagorno-Karabakh enclave, which is part of Azerbaijan, was the subject of a war with Armenia that has left it a de facto independent republic, which is not internationally recognized, ironically including Armenia which "supports" it. Azerbaijan has lost 13% of its territory and must support some 800,000 refugees and internally displaced persons as a result of the conflict. Despite a 1994 cease-fire, Azerbaijan has yet to resolve its conflict with Armenia over the Azerbaijani Nagorno-Karabakh enclave. Occupied by the local Armenian troops to this day, this conflict has not officially ended with minor skirmishes frequent, and is a major source of contention among Azerbaijanis. " It's probably best that we discuss before continuing in light of disagreement, so I have reverted the article to the prior version per Wikitravel:Consensus#Status quo bias. I don't have any serious problems with either version in terms of reconciling them, but would strongly suggest that we significantly decrease the amount of attention paid to the N-K conflict in the understand section, as it's not terribly important background information for travelers, who would be better served by information related to the kinds of things they will see when visiting the more visited parts of the country (Baku, Sheki, Qobustan, etc.). Very few visitors are going to see anything related to the war and none will visit N-K on their Azerbaijan trip. This page was last edited on 7 November 2017, at 17:37.